TWELVE-YEAR-OLD MEDEA TWIRLED A LOCK of her long black hair around a gold-tipped laurel-wood wand. Her wand was magic. A standard school supply, it had been issued to her at Enchantment Academy earlier in the year. With each twirl of the wand, streaks of rainbow sparkles zinged from its tip through her hair. And each time she unwound the curl from her wand, the streaks quickly faded to black again. However, as she sat on a window seat in the throne room of her father’s palace in the land of Colchis on the Black Sea, Medea didn’t notice any of this. Instead, her blue eyes were glued to the scroll in her lap. It was last week’s issue of Teen Scrollazine. On Friday she had traded her lunch money for it to a girl at school named Glauce. (Totally worth it!) It was Sunday night now, and all weekend Medea had been sneaking around here at home, reading the ’zine in secret. Not only was T-zine full of fashion advice and news stories, it contained a column penned by Pheme, the goddessgirl of gossip. Her column was all about the exploits of the gods and goddesses of Mount Olympus. And it was especially delicious this week! It seemed that Aphrodite, the goddessgirl of love and beauty, had worn painted bronze accessories with one of her dazzling pink chitons recently, setting off a new fashion craze among mortals on Earth. Also, Eros, the godboy of love, was testing out mini-size versions of his magic crush-causing arrows. And if Pheme had her facts straight, some students in a class called Hero-ology, which was taught by Mr. Cyclops at Mount Olympus Academy, would soon embark on a mysterious, heroic adventure! Suddenly Medea’s head popped up like she was a rabbit scenting danger. Footsteps! And voices! King Aeëtes (her dad) and Circe (her aunt) were coming her way! With a quick wave of her wand, she caused the window seat’s curtains to magically whip shut around it, closing her off from the rest of the room. There was no telling what her dad would do if he caught her reading the ’zine. He had strict rules, and he disapproved of Teen Scrollazine big-time. He only wanted her to read things that made her “smarter.” Which he claimed gossip didn’t. Maybe not, but in her opinion Pheme’s column was a lot of fun. And shouldn’t reading be fun? Often the reading material her dad did approve of (hello, encyclopedia scrolls?) wasn’t. Besides, there was other stuff in the ’zine too. A few weeks ago there had even been an article about her dad’s amazing cape. The one he’d nicknamed the Golden Fleece. But even that article—which had been stuffed with facts—hadn’t impressed him. Still, everyone she knew practically devoured the stories in the ’zine. If she didn’t do the same, she wouldn’t know what they were talking about at school on Monday! Stomp, stomp! Tap, tap! The two sets of footsteps stopped right outside the window seat where she sat. Medea held the ’zine against her chest and tried not to breathe too loudly. “I’ve had a vision. Danger is coming,” she heard her aunt Circe say in that special faraway voice she used when she was telling a prophecy. 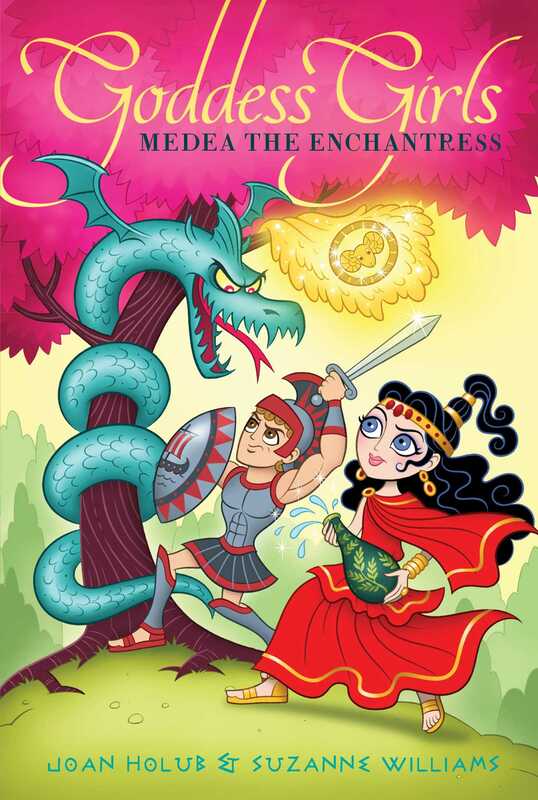 Not only was she Medea’s aunt, she was also one of the greatest sorceresses of all time and the principal of Enchantment Academy, where Medea attended school. Medea’s eyes rounded and she let out a tiny gasp. Luckily, her dad snorted at the same time, covering the sound she’d made. Medea’s gaze shot to the windowpane behind her. In a distant part of the realm she could see green puffs of smoke rising into the air. They were coming from the fiery snout of the very dragon her father spoke of. One that never slept and always prowled around the sacred grove where the fleece hung, unblinkingly keeping guard on it. The serpent-dragon obeyed her father faithfully and no one else. A ray of sunlight fell upon the fleece where it hung from the grove’s largest and most splendid oak tree. The picture of a fierce-looking ram’s head that was embroidered on it with golden thread momentarily gleamed like fire. That cape was cool, she had to admit. It was woven from the wool (aka fleece) of a rare and famous ram (a male sheep). Her dad displayed the fleece on a high branch outdoors in order to honor its origins as a wild animal. The king only wore his fleece cape on super-duper special occasions, but he adored it so much that he went to visit it every day. He’d even had a jeweled chair set below it so he could sit and admire the cape for as long as he wanted. Sometimes Medea thought he loved that fleece more than her! At this information Medea whipped her head toward the sound of their voices again. Handsome boy? She scooched quietly across the window seat cushion and parted the curtains a crack with the tip of her wand, just in time to see her dad frown. “What? Medea’s only twelve. Much too young to be thinking about boys,” he huffed. “Ha! Well, maybe I’ll just put out a proclamation that any boy caught within a mile of my daughter will be jailed! That’ll put a stop to any heart stealing.” Looking pleased with this solution, yet still a little worried, the king turned to go. Ooh! This is reeeally getting interesting! thought Medea. Danger was coming. She might get to go to MOA with her aunt. How exciting! And a crush? Well, she wasn’t that into liking boys, but whatever. She didn’t have to crush on anyone she didn’t want to, no matter what appeared in Circe’s visions, right? Rising to her knees on the cushion, she angled her head for a better view of her dad’s face. Her aunt was one of those cool grown-ups who “got” kids and let them have fun, within reason. But one look at her dad’s expression, and her hopes of going on an adventure to the school attended by awesome immortals like Aphrodite and Pheme were pretty much dashed. Medea felt her cheeks burn. Her dad treated her like a little kid sometimes! His rules for her were way stricter than those he had for his royal subjects. He was always trying to control her every move, forever bossing her around. “Go here! Do this! Don’t do that! Get your homework done! No reading Teen Scrollazine!” At least, that’s how it seemed to her. He wouldn’t let her hang out with kids he didn’t approve of either, and he wouldn’t let her board at the Academy like everyone else did. She was the only student enrolled at EA who had to travel to and from home. That meant a half hour of travel by wand magic from Colchis way over to the Academy on Aeaea Island and back. Every. Single. Day. Not only was that a big pain logistically, it also meant she had zero chance of being one of the students invited to join the Magicasters Club in the upcoming annual tryouts. Because that club met after school, while she was here at home in Colchis. “If you don’t give your daughter any freedom to make her own mistakes, she’ll never learn how to take care of herself,” Circe argued. Medea’s fingers fisted, one hand clenching her wand and her other crunching the scrollazine she still held. Grr. She squinched her eyes shut so they wouldn’t flash and give her hiding place away. Or cause a fire hazard! The granddaughter of the sun god Helios, she’d been born with eyes that flashed fiery-hot, golden light rays whenever she felt strong negative emotions. Like now, when she was totally and completely annoyed by her dad! Or like the time when she was four years old and some mean kids made off with a pile of seashells she’d been collecting on the beach. She glared at those kids so hard, they got sunburns. Most people thought they’d just been out in the sun too long that day, but Medea’s dad and aunt knew better. After that, they watched her closely and made rules. Still, they couldn’t watch her all the time, and well, sometimes people just stressed her out or made her mega-mad! After the sunburn incident there had been the tomato incident back in first grade. That had sort of been her classmate Glauce’s fault, though. And it had marked the beginning of Medea secretly nicknaming that girl her “frenemy.” Because that term meant “a person who sometimes acts like a friend and other times acts like an enemy.” Which described Glauce 100 percent! Not wanting to think about that horrible tomato incident right now, Medea gave her head a shake to clear it and then went back to eavesdropping. Yeah, Dad. It’s only for a week. Let me fall on my face if I want to, Medea whispered, but only in her mind. She didn’t really think anything bad would happen if she got to go to MOA with her aunt. Happy scenes of just the opposite filled her head. If she did get the chance, she promised herself she wouldn’t trip up. Instead she would find a way to make a fabulous impression on the immortals who went to school there. And news of her success would find its way back to her dad. She smiled dreamily, imagining his proud face when that happened. “Don’t forget that if you let her go to MOA, you might be able to thwart the heart-stealing part of my vision. Which might prevent the fleece-stealing part from coming true as well,” coaxed Circe. Her dad scowled at her aunt. “I said no, and that’s final!” he roared. Stomp, stomp! Tap, tap! Her father’s and aunt’s footsteps faded from the room as they exited it and moved down the hall. Medea parted the curtains a tad wider and held her ear to the opening, listening for more. “I’m not going to let this go!” Circe was insisting. Score! thought Medea upon hearing this. Because her aunt was very good at getting her way. Once it was quiet, Medea leaped from her hiding place. When her red lace-up sandals touched the floor, she did a little happy dance out of the throne room. Then, all the way down the long, marble-tiled hall to her bedroom, she waved the rolled-up ’zine like a parade leader with a baton. Confident of Circe’s ability to eventually persuade her dad, she decided to go pack her sleepover things and pick out the perfect accessories to wear with her school uniform tomorrow. Because she had a feeling she would almost certainly be traveling on from EA to Mount Olympus! If she could do something while there to make her dad proud, then maybe, just maybe, he’d stop being so bossy. And after she came back from MOA, he might even agree to let her board at Enchantment Academy and just come home on school breaks or on weekends like other kids. That way, she’d have a chance at joining the Magicasters Club after all! Squee! As she came to a stop before her wardrobe and began going through her stuff, she recalled her aunt saying that she could use a couple of assistants. Hmm. Which other student from EA would Circe choose to go with them?